I like having a little seating in the foyer for putting on shoes or chucking your bag when you walk in the door. 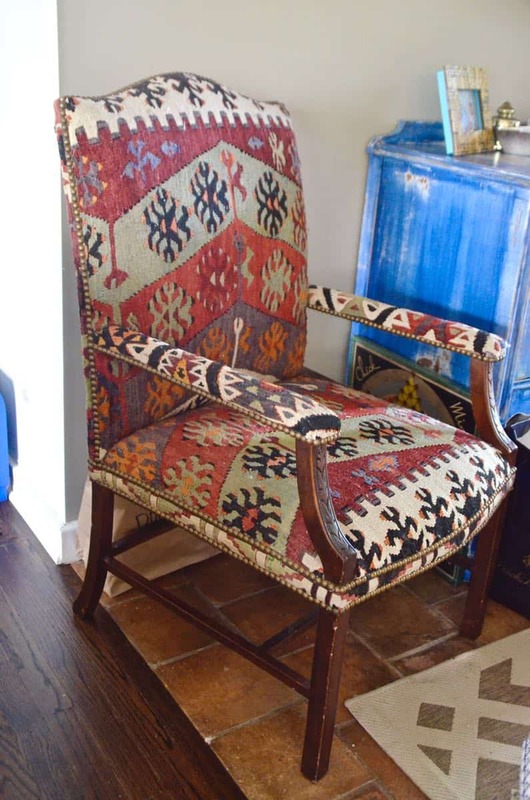 I picked up this amazing arm chair upholstered in kilim carpet from Craigslist because of the simple lines and the size. Other chairs felt dwarfed by the foyer table, but this was the perfect height. 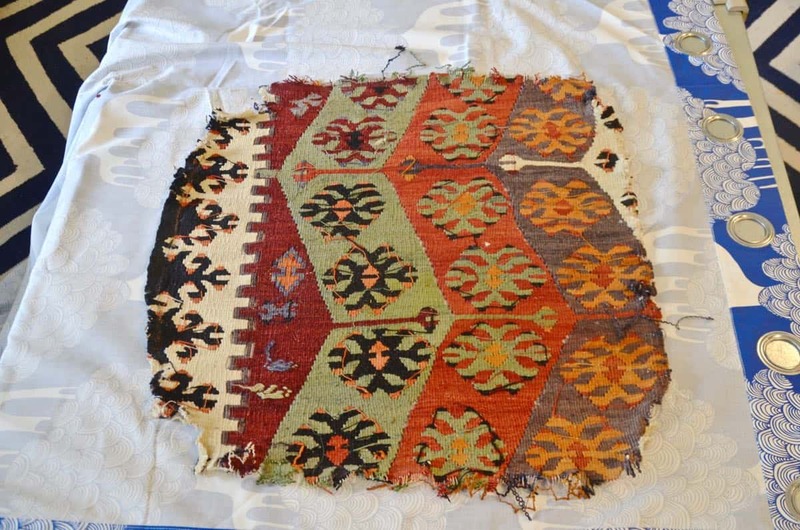 Sadly… the kilim was filthy and frayed or else I would have left it alone! 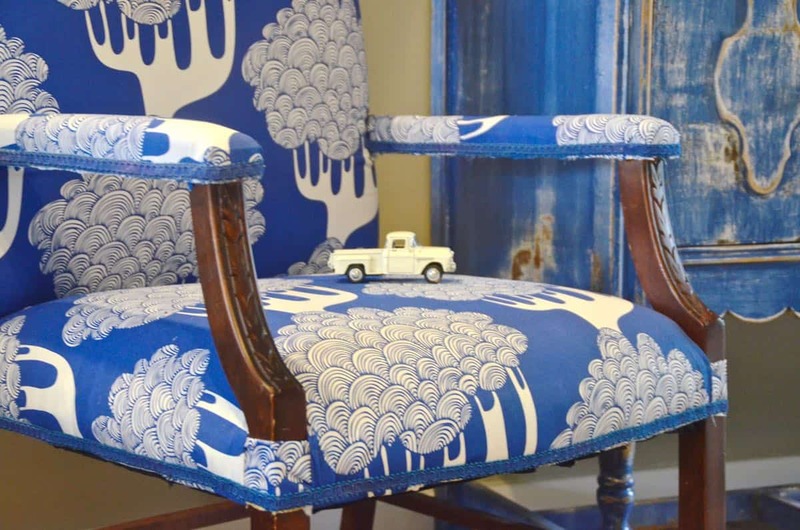 Here’s my philosophy with upholstery… what’s the worst that can happen?! The chair needed to be recovered so why not try my hand at it. If it’s a disaster, I can always take it into a real upholsterer to get fixed! So I dug in! 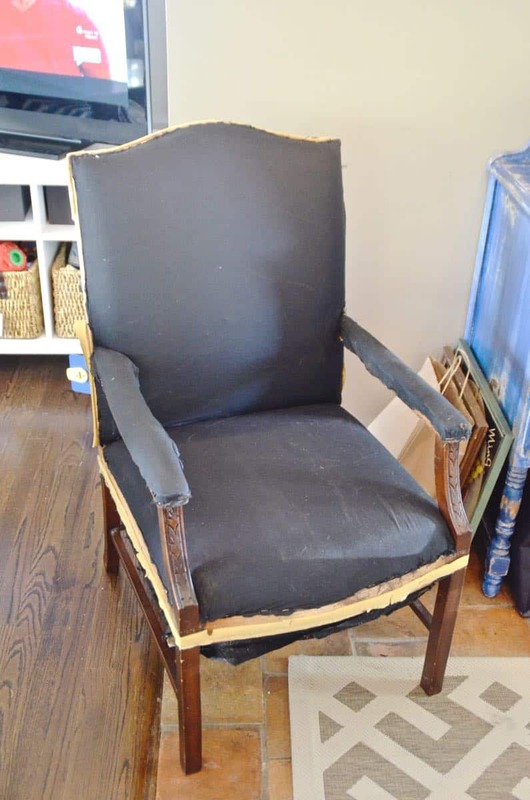 This chair wasn’t much different than the other upholstery projects I’ve done. First step is always pulling off the old fabric. Make sure you save it as a template if possible! As fun as this chair looked, it was disgusting when I started pulling the fabric off… dusty and dingy. Getting all the fabric off took the longest with this project: nail heads, lots of old staples, and very thick heavy (filthy) fabric. Upholstery is incredibly satisfying but not for the faint of heart… nail heads and staples and lint balls, oh my! With the chair free from its kilim, I reached for my new fabric. 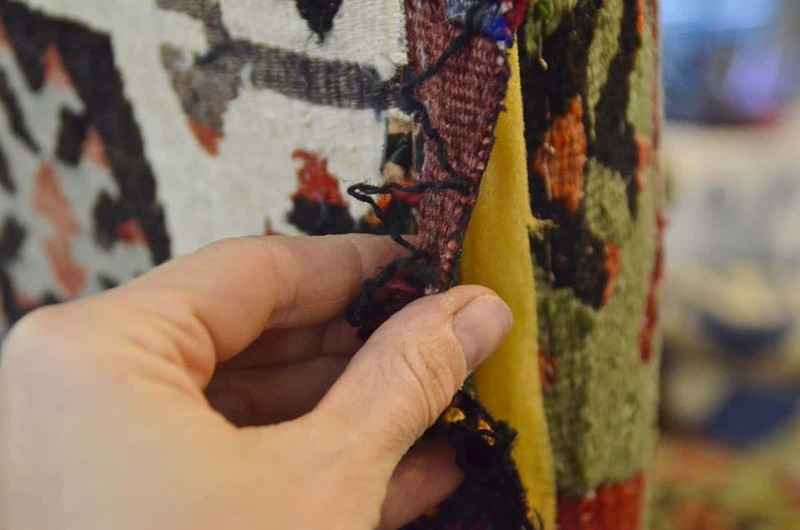 Let’s pause for a minute to discuss the biggest costs when it comes to upholstery. Foam and fabric. The foam for this chair was in tact so… no need to replace. But fabric can add up! 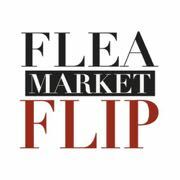 Upholstery fabric can be $20-$40 a yard! In a MacGyver decorating move, I reached for my secret new cheap upholstery material: curtains! I went with these amazing Kajsamia curtain panels from Ikea. 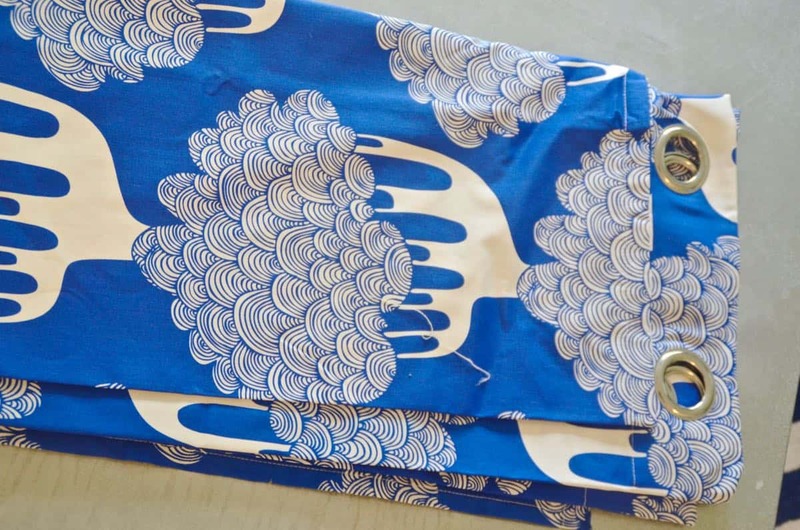 They’re a nice sturdy cotton and I fell in love with the modern graphic pattern. I trimmed the excess fabric and covered the staple line with a matching strip of gimp. The foyer chair is reborn! 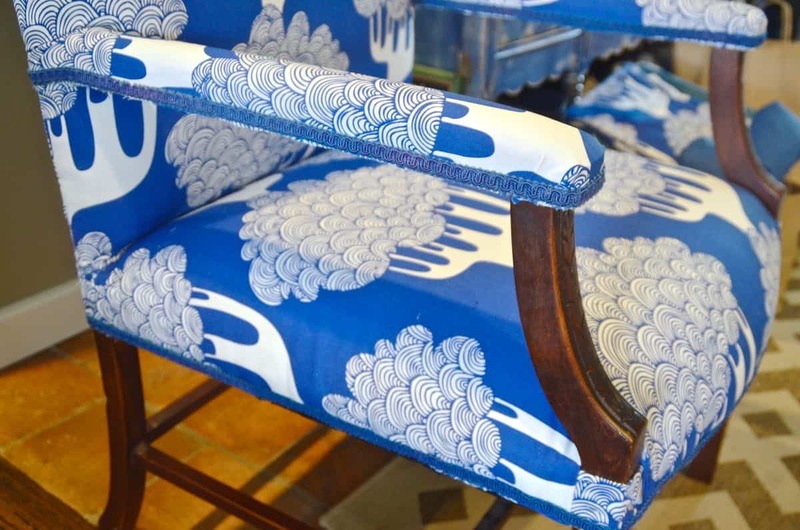 I’m no upholstery expert but am happy to answer specific questions if you have them; just post a comment! 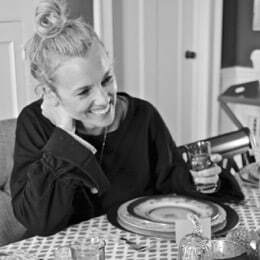 I take chances and try not to be limited by some idea of ‘the rules.’ In this case, the upholstery was easier than it looked, and the Ikea curtain is a fun, unexpected (cost effective!) pattern for the front foyer. It really is a great pattern. I always try to take chances with fabric too. 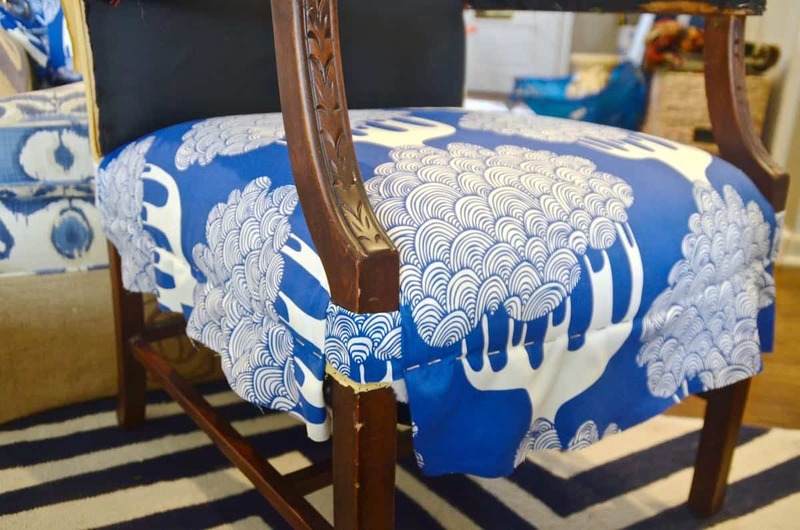 I did the back of a chair with cool zigzag bed sheets once. Like you said, gotta take chances. This one really paid off for you. Genius. Hi there. I’m a new follower and I love your blog. 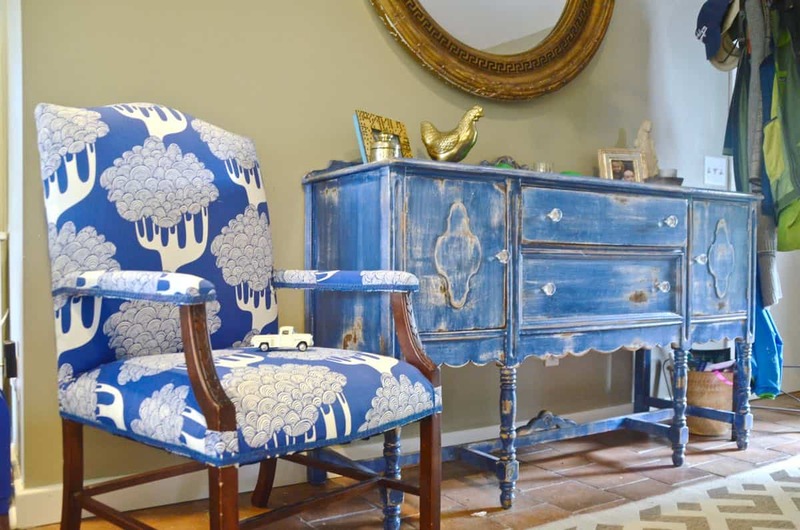 That fabric truly is amazing – and you did an extraordinary job on the reupholstering! 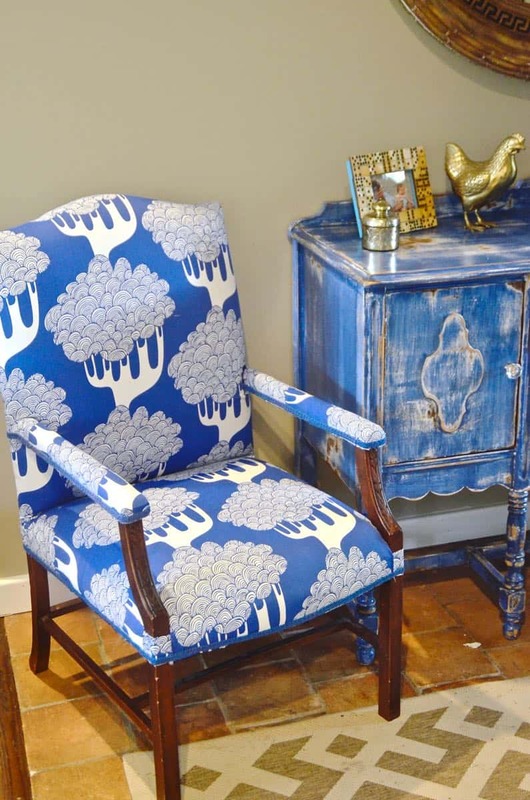 For my house, I would have painted the rest of the chair white – but the wood fits wonderfully with the rest of your decor. Now that school is out, I have time to read your blog:) Your projects are awesome and inspiring. I love this chair!! I wonder if I have room to do a reupholster project? You make me feel like I should try! Anyways, nice to see you’re keeping yourself very busy and feeling satisfied. The kids look great. Enjoy the summer and be in touch. Curtains! What a great idea, now you’ve really got me thinking! Haha! Tablecloths could work too! Good luck! I loved this article. Who would of thought Curtains. I too am looking to do a small chair for foyer. You have inspired me. Thanks again. Look forward to seeing more from you.